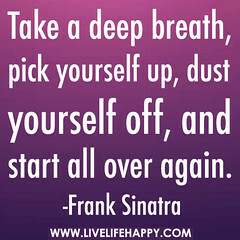 Starting over is hard to do but it could be the beginning to a whole new you! I know…it sounds corny, but why don’t we embrace starting over? I guess it’s because starting over represents change and change is sometimes scary but what if change meant you were about to embark on finding a better you? We all talk a good game about wanting to “Find ourselves” but when the time comes for the hard work to begin, we balk and sometimes run from the very thing we claimed we wanted. I am no longer running. For years, I have talked about wanting to write and I always managed to talk myself out of it by using my favorite excuse of–“I’m too tired because I’m always working”. This was a true statement, I was ALWAYS working but really, I was ALWAYS procrastinating! In a previous post, I talked about my propensity to procrastinate and how it has affected me my entire life but what wasn’t discussed was why I was procrastinating. If I did what I claimed I wanted to do, which was write, I would have to first believe in myself and more than anything, that is what I was lacking. I knew I had the talent to write but because I didn’t believe in myself, I blocked my own blessing and it took the Lord to step in and save me from me. It’s crazy that I had to get fired in order for me to realize what I was supposed to be doing and it’s even more crazy that even after I got fired, I still procrastinated by saying that I had to have A, B and C in place for it to be right. A, B and C never fell into place. What did fall into place was my being faced with running out of money. Now I know that starting a blog wasn’t going to lead to immediate riches but in order for me to become the writer I wanted to be, I knew that blogging was the medium I was supposed to use to begin my career as a writer, so it is funny that even knowing this, I still put it off. I didn’t fully believe in me. I remember the first promotion I received which wasn’t expected. I had been working hard but only because I was a hard worker and while my ultimate goal was always advancement, I wasn’t, by any means, looking to advance having been in the job as an assistant manager for two years. There had been some rumblings that there was going to be movement in the office and all indicators pointed to me being moved to an office that was further away. When the news was delivered that I was not the employee who would be moving and that I was also being given the manager position, I was shocked to say the least. When I got in my car and processed what I had just been told, I said out loud–“Well…I didn’t see that coming!” When God decides you are ready to transition to your next calling whether you see it coming or not, it is going to happen and if God believes in you why don’t you believe in you? I am finally ready to believe in me. No matter what is thrown in my direction to deter me from my calling I am going to stay focused and apply the same skills that earned me my surprise promotion. While it is scary to be starting over, I am excited about what starting over means and I look forward to the new challenges I am about to face because I know that where I am today is in God’s plan and there is no arguing with that! Awesome. Starting over as one of the scariest things I have ever done. I am sure you can see where this is going…. it has also been the most rewarding. All my best! !